Blocky diploid Charleston Grey hybrid watermelon. Strong, prolific vine with heavy set potential. 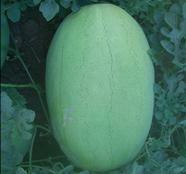 The oval blocky fruits have a grey to light green rind, with green scribblings. 10 - 12 Kg in weight fruits with deep red crispy flesh, with high brix. Crown F1 is a high producer of uniform fruits.